For people like me – that is to say, professional expats with amateur tax-filing skills – Vincenzo Villamena is a Godsend. 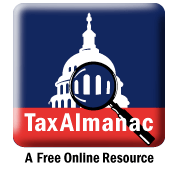 He started Online Taxman to specifically help American expats doing business abroad successfully file for their taxes. All you startup founders abroad, listen up. It’s tax season time and Vincenzo and his team of skilled CPAs are ready to take care of all your tax woes with their expat tax services. Tell us a little more about what inspired Online Taxman. I always wanted to work in finance. After a stint with PricewaterhouseCoopers after college, I landed my dream finance job working as an investment analyst in a private equity firm. Six months later, I decided I never want to work in finance. Relentlessly inclined to stick it out, I worked there for 2 more years. During this time, I would do my friends taxes as a favor and for extra cash, usually after work, on the weekend, etc. Never had time to meet with anyone, just online via email and phone conversations. I mean, who wants to waste time out of their schedule to go sit with someone and watch someone fill out paperwork? From my experience, about 10% of people under 40 really find this as a necessity. When I decided to quit my job, I figured taxes would be a good way to go. I was exploring opportunities in the industry and looking at franchising HR Block, Liberty Tax, etc. I was late to a franchising meeting for Liberty Tax (because of another long day at work), so when I showed up, the meeting was over. I saw the local franchiser who I spoke with on the phone and was actually invited to dinner with the CEO of Liberty Tax, John Hewitt (who also started Jackson Hewitt). I remember very vividly at dinner telling him that I had been doing taxes online and was thinking of starting something similar, with the possibility of franchising his brand as a horizontal integration. He completely scoffed at my idea and literally told me, “That will never work, people want to see someone face to face”. I walked out of that dinner and into a new lifestyle. So, what happened after you jumped ship? 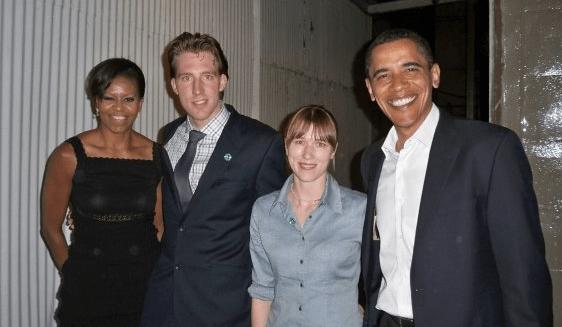 I left my life in NYC – job, apartment, girlfriend – and decided to start an online tax company. When you do something that drastic, you figure you might as well go all in, put your chips on the table and go buckwild… so I also moved to Buenos Aires, Argentina. I built the website in South America to focus on doing taxes online. But then I took another turn. While in Argentina, I realized that there was a big need for doing taxes for US expats and also nonresidents with US interests (businesses, real estate, stocks). I made my website specifically focused on this niche due to the complexity and the need for potential clients in foreign countries to complete these taxes through virtual means. I created an online portal, offer a free consultation, and offer an easy way to connect to your own CPA, year after year. Right now, my customer base is split 50/50 between US expats and stateside clients. 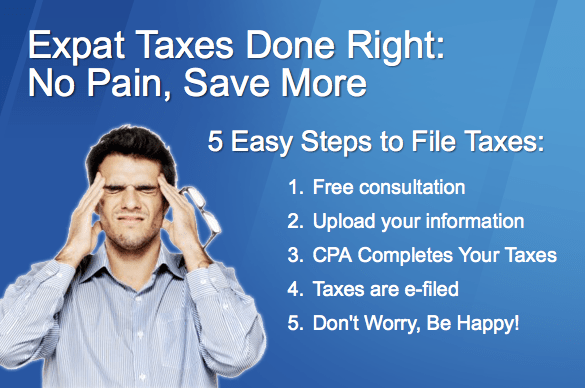 I have 6 CPAs working for me – all virtually with a base in NYC. I work half the year, travel the other half but ALWAYS have time for my clients! What is your best advice for US expats filing for their taxes abroad this year? If a US citizen stays abroad for over 330 days in a 365 day period, they are NOT SUBJECT TO TAX for up to 95k of their earnings. Furthermore, establishing residency abroad (via a business visa or foreign passport) can lead to this foreign income exemption without this time requirement. They still have to file taxes, but NO income tax will be owed. Foreign residents (not US citizens/residents) can own LLC’s and not be subject to tax in the US. I help a lot of startups with foreign owners to set up LLC’s to have US bank accounts/Credit Card processors without any US tax implications. Be aware of new IRS compliance issues under the FATCA laws, foreign bank accounts and assets (including stock, bonds, options of foreign companies and foreign pensions) of US citizens/Residents must be disclosed to the IRS. These rules have major consequences and US is currently signing information exchange treaties with foreign countries. What are some of the biggest issues you see regarding startups and their tax issues? Applicable when receiving unvested restricted stock or options. Must file within 30 days of receiving restricted stock or options. Under normal IRS rules, one would have to recognize income when this stock vests (equal to the difference in value of the share on the vesting date vs. the date the shares were received). This presents two problems if the stock has appreciated since the date of purchase: (x) there is a significant tax liability and (y) there likely has not been any cash received for the stocks in question, nor is the stock liquid enough to sell. If an 83b election is filed, no income is recognized until the stocks are actually purchased so no income is recognized income when the stock vests, but rather then it is bought. 2. Phantom income issues for sweat equity. We try to avoid these people getting taxed on options/equity they have by setting up an LLC with multiple equity classes and grant a “profits interest” aka carried interest to sweat equity members. 3. ISO vs. NQ options. There are certain rules about each that are specific to the holding period of the options. Note that Incentive stock options (“ISOs”) can only be granted to employees. Non-qualified stock options (“NSOs”) can be granted to anyone, including employees, consultants and directors. It’s important to keep your books in order with one corporate bank account to track everything. There are tons of free options out there to manage the bookkeeping, with Freshbooks and Mint being two good options. Remember, this isn’t just for tax purposes. Accounting is the foundation of all businesses so its important to understand your business and examine everything from cutting expenses to seeing revenue trends. Also, ALWAYS negotiate with vendors. Every price is flexible and being lean is optimal. 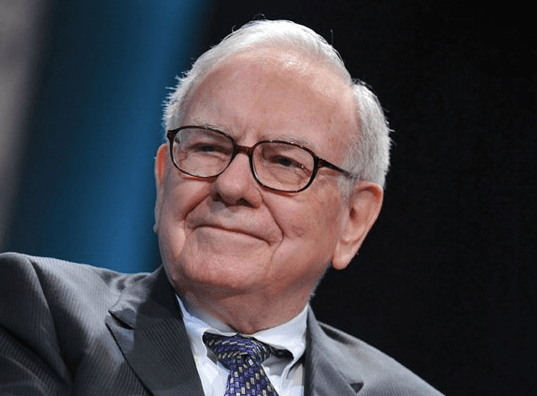 I would break bread with Warren Buffet to pick his brain on his theories behind value investing and picking businesses to invest in. He is overlooked by the cooler, more tech entrepreneurs like Steve Jobs or Bill Gates, but he is an original and a class act to match. I’d have to go with pasta, specifically gnocchi sorrentina, because it’s my favorite! Finding talented people to work for you while still bootstrapping. It takes some time to find good quality people (especially off shore developers) that will work for equity and truly believe in the business. Don’t be afraid to fire people that don’t fit the culture you want to implement. Taxalmanac.org I’m sure that’s pretty self explanatory. Spotify. Kid Cudi, Swedish House Mafia, Pearl Jam, Led Zepplin. Musically, I’m all over the place basically. What’s the greatest thing about Online Taxman? I think we are very unique because we put our clients first and offer really good service, efficiency and a reasonable price. Off the bat this is apparent, because we offer a free consultation, which is unique to all of our competition. We aim to create a relationship with each customer by offering a personal CPA they can go to year after year (which is also unique as no online firm offers a CPA only regular accountants). The virtual nature of the firm has allowed us to invest in two areas: our technology (customer portal and backend) and people (all are CPA’s), NOT spending it on fancy Park Ave offices or expense accounts while still being affordable to our lean startup clients. 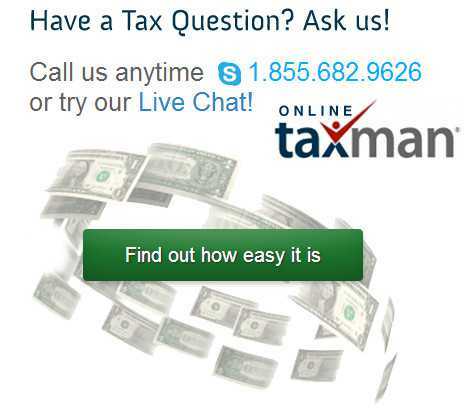 The website, or our toll free number 1-855-OTAXMAN (855-682-9626). You can always reach me for a free consultation and if you mention that you know us through KillerStartups, I will personally give you a free consultation (email Vincenzo [at] onlinetaxman [dot] com). I’ve already received my personal consultation from Vincenzo and I highly recommend you do too. Wait, that sounds wrong. Taxes, people. I’m talking about taxes!